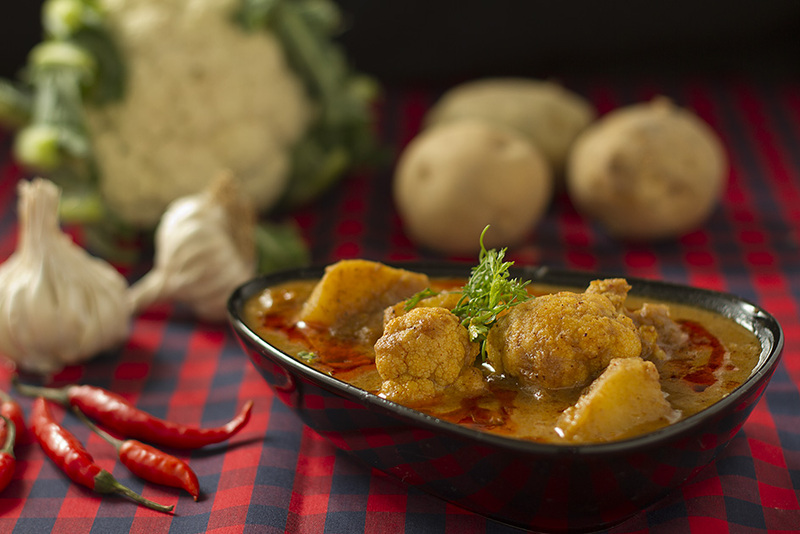 Cauliflower And Potato Curry in Coconut Milk has the creamy goodness of Coconut milk and a blend of spices that are unique to Mangalorean recipes. I usually cook Cauliflower as a dry vegetable, rarely as a curry, but I came across a lovely Mangalorean recipe of Cauliflower curry in a book and decided to cook and document it. Combining large pieces of Cauliflower and Potatoes in Coconut milk spiced delicately with cumin, cinnamon, coriander, cloves and peppercorns and tempered with mustard seeds and curry leaves, this delectable Cauliflower and potato curry is best served with hot steamed rice. Yes, my Mangalorean friends, I have attempted to make Hukosu and Aaloo Ghasi 🙂 Given the fact that we are primarily a non vegetarian household, I was skeptical about the acceptance of this dish. It was well received but a suggestion lingered… Let’s make this curry with Chicken instead of vegetables. So in a few days, you will see the same curry made with chicken chunks – Kori Ghasi. Soak 1 cup coconut in 2 cups warm water. Leave for half an hour then put it through a blender. Strain and keep the coconut milk. If using ready made coconut milk, skip this step. In a non stick frying pan heat 1 tablespoon oil and saute 1/2 cup chopped coconut for 2-3 minutes.set aside. Heat another tablespoon oil and saute half the onions for 2-3 minutes set aside. Heat one more tablespoon of oil and saute half the curry leaves, red chillies, coriander seeds, mustard seeds, dried fenugreek seeds, cumin, cinnamon, peppercorn and cloves for a few minutes. Remove from the pan and keep aside. Mix the sauteed coconut, fried onions and spices and run it through a blender. Add tamarind juice and a little water to make it a fine paste. In a saucepan,heat 4 tablespoon oil, temper with remaining curry leaves, add ginger and garlic and saute for a few seconds, Add the balance onions and fry till they turn translucent. Add turmeric powder and red chilli powder and saute for a few more seconds. Tip in potatoes and fry along with the spices for a bit. Add Salt and some water and cook for 7-8 minutes, till the potatoes are partially cooked. Add Cauliflower florets and coconut milk and let the curry cook for about 5-7 more minutes or till the Cauliflower florets are cooked (but are still crunchy) and the potatoes are cooked completely. Serve this delectable Cauliflower curry on the side of hot steamed rice with a dollop of ghee.